Quantifying biomass dynamics within degraded forests is a challenge. Recommended approaches include coupling inventory data with satellite observations (Gibbs et al. 2007). 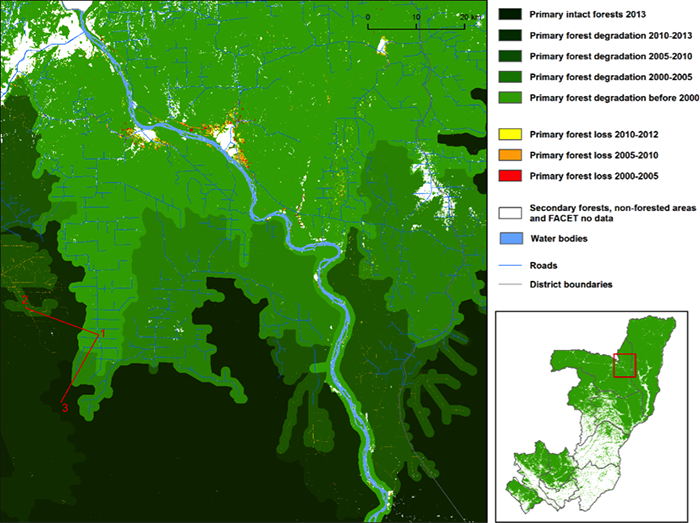 This study combines remotely sensed-derived degradation time-series maps with field data collection to assess biomass change within the logged forests of the Republic of Congo. By combining time-series of indirectly mapped degradation, we will in effect swap space for time, targeting forests of varying intervals since disturbance. Additionally, directly observable forest cover loss due to infrastructure development in support of logging will be employed to estimate aboveground biomass loss. We will use as a reference state in situ biomass estimates from local terra firma Intact Forest Landscapes to calculate aboveground carbon loss due to both clearing (deforestation) and forest degradation.